Syncplicity is a cloud storage solution that caters more to the needs of larger businesses rather than individual users. The provider does offer a personal pricing plan. However, as you will see in our Syncplicity review, this service provides businesses with a host of perks and benefits. As far as the personal plan is concerned, the offer is pretty basic. We’ll talk more about Syncplicity pricing plans and offers in the following sections of our Syncplicity review. Syncplicity is a cloud storage solution that focuses as much on keeping data safe as it does on enabling you to share your data. In spite of its name, Syncplicity actually offers a pretty complex package of additional features and options. However, as we already mentioned, most of the perks are available for the business packages. 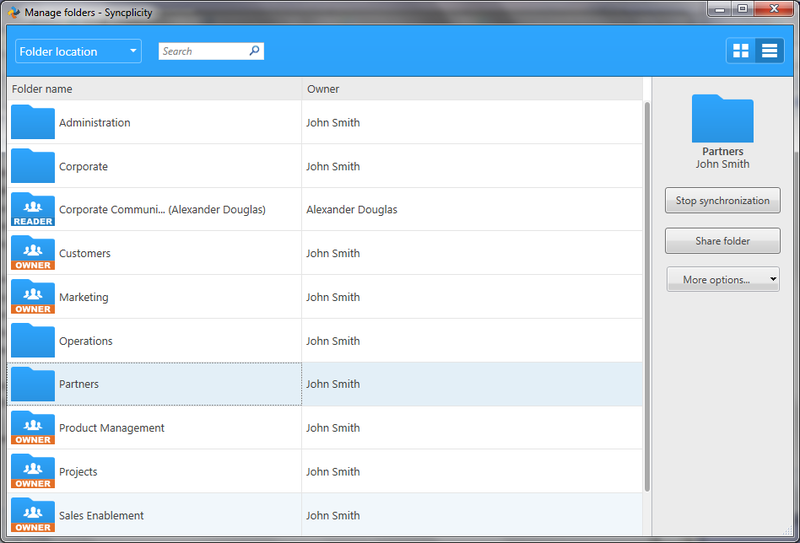 With Syncplicity, apart from storing your information, you can easily share folders and create clearance levels. Syncplicity allows you to edit files. Files stored in the cloud can be accessed using mobile devices, as well as any computer, provided they have the necessary authorization. Syncplicity also features real time synchronization, which ensures all your team members have access to the right file version as soon as it is updated. These features may not be available on all plans. In the next section of our Syncplicity review, we will discuss Syncplicity pricing plans and what you can get for that price. As a cloud storage and backup service, Syncplicity offers individual plans, business plans, and enterprise plans. Although it’s more expensive than other cloud storage services, the benefits outweigh the cost. Personal (Free) Free 10 GB Real-time sync across multiple devices; File versioning; File sharing and collaboration tools; Mobile editing; Unlimited file size; Unlimited number of affiliated devices; No bandwidth restrictions. Personal $60/year 100 GB Unlimited file size; Real-time document protection; PDF annotations; Send larger files with Outlook extension. Business (3+ users) $60/year 300 GB +5 GB/user IT admin controls and reporting; Active directory integration; Single-sign-on feature. Enterprise (25+ users)	 $150/year/user Unlimited storage Use cloud; On-premise storage; Full integration with EMC Documentum and SharePoint; API; Mobile access to home computer; Network sharing. Each pricing plans will continue all the features of the previous plan, plus the additional features mentioned. For more information about Syncplicity pricing, visit syncplicity.com and check the Pricing sections. In the following sections of our Syncplicity review, we will take a closer look at the features it has to offer. We will also try to see how well Syncplicity performs in these areas. To use the Syncplicity backup feature, you need to manually place the files you want to store on the cloud in the Syncplicity folder. You can upload files of any size. Moreover, you can use the backup feature from any device you have, as long as it’s connected to cloud. Syncplicity features real-time synchronization. This means whenever you upload a new file to the cloud, or when you modify a file that’s already in storage, all your devices should have the updated version in a matter of seconds. Syncplicity allows you to choose which files you want to restore. To restore a file, all you need to do is to download it from the appropriate folder. The file restoration system is quite similar to that of Dropbox. Since Syncplicity also supports file versioning, you can select not just the file you want to download but also the version. You can also recover deleted files in this way. Another nice perk of the Syncplicity restoration procedure is that you can download them as they are. They don’t come archived. According to Syncplicity’s official website, all your data is encrypted before transmission using an AES-256 security key. Syncplicity offers file versioning as part of the basic package of features. You will be able to view and restore up to 10 versions of the same file. Your data will remain in the cloud for a period of 30 days by default. However, the user can extend or reduce this period according to his needs. 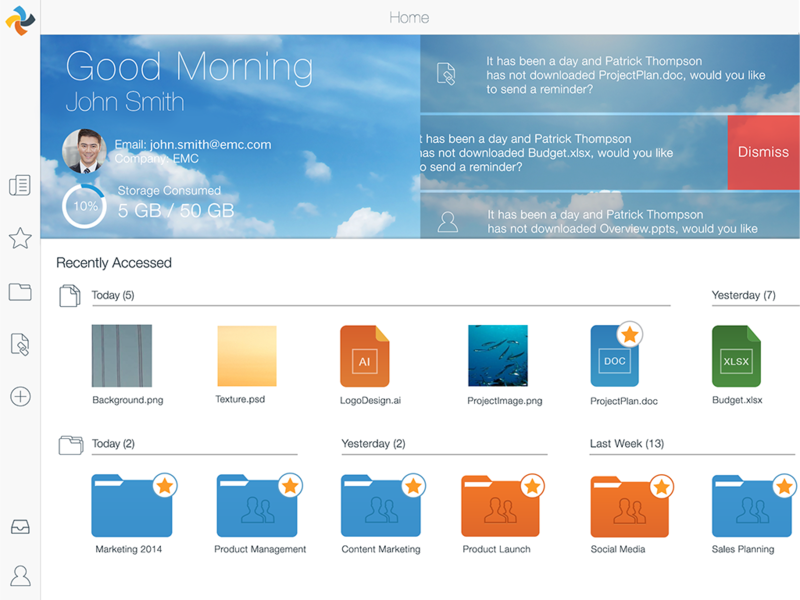 You can also use Syncplicity as a file sharing service. Unlike free file sharing programs, Syncplicity file sharing has no limit when it comes to size. In this part of our Syncplicity review, we will summarize the key points we’ve learned so far about this service. The main pros and cons of this cloud storage product are outlined below. Pricey compared to other products. Naturally, the first alternative that comes to mind is Dropbox. In the Syncplicity vs. Dropbox battle, it’s hard to decide who wins because both are champions in their niches. For instance, Dropbox is easier to use when you need to share and sync large files across multiple devices. However, if you have a large number of files uploaded to the cloud, Syncplicity is a far better choice than Dropbox since it has a search bar. Overall, our conclusion is that Syncplicity is a better cloud solution for businesses, whereas Dropbox fares better as a personal cloud. If you’re looking for a more cost-effective alternative, SugarSync may be a better option. SugarSync is perhaps one of the most affordable cloud storage solutions and among Syncplicity’s main competitors. However, SugarSync doesn’t allow users to upload folders bigger than 300 MB, whereas Syncplicity doesn’t have a file upload limit. To conclude our Syncplicity review, we have to make a couple of observations. First of all, Syncplicity would have been the ideal cloud storage, backup, and restoration service if not of its snail-like upload speeds. However, the service manages to make some amends thanks to its advanced indexing features, user-friendly interface, and gorgeous Syncplicity apps. If you’re looking for a cloud storage solution for a small business, Syncplicity is a good choice overall. However, the Syncplicity personal plan is somewhat bare bones. Overall, Syncplicity is a decent and dependable cloud storage service, which can work wonders for both individual users and businesses.